Feta “cheese” made out of tofu? Blasphemy! I, too, was skeptical that bland, mushy tofu could be turned into the deliciousness that is feta cheese. Luckily, I was also curious as to what it would taste like. 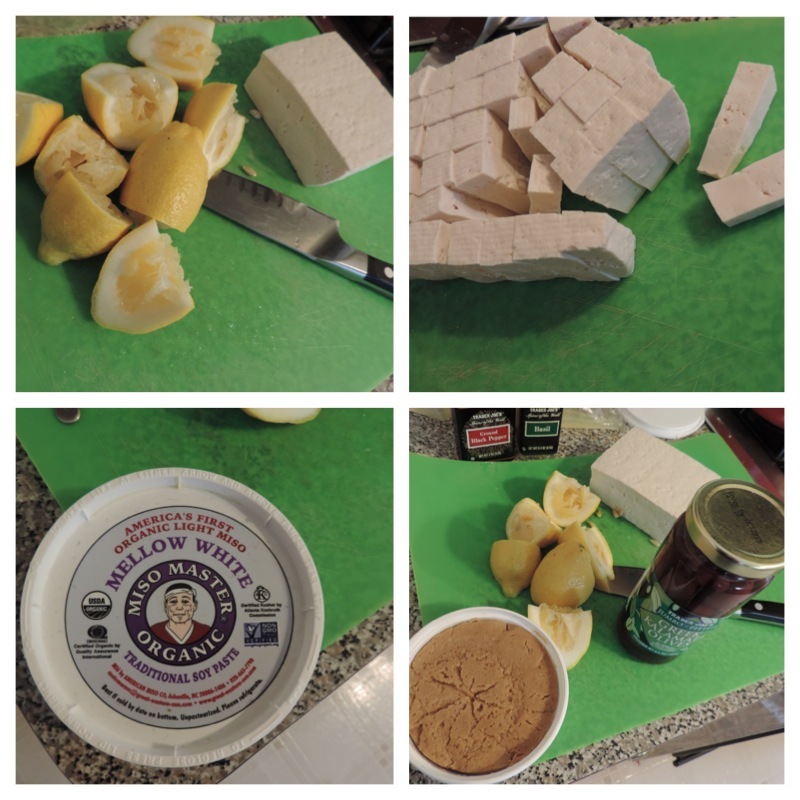 I can’t take credit for the vegan tofu feta — it was of course something I stumbled across on Pinterest. However, I did upgrade the original recipe a bit, which I think made all the difference here. Here’s the original recipe link for reference. But really, does anyone actually like tofu? I mean I’ve added the soft version to smoothies — and then gotten grossed out that I was drinking tofu (regardless of whether or not I could taste it) and promptly thrown my smoothie out. And while I love tofu from Thai restaurants, that’s probably because it’s fried and smothered in curry sauce. Let’s face it, anything that is fried and smothered in sauce — especially curry sauce — is going to be delicious. Okay, so back to tofu “cheese.” The trick here is to let this baby marinate for at least a day (the longer, the better). Once you’ve squeezed out the lemons and have all of those leftover lemon peels, you should definitely do as I did and make lemon-infused vodka. 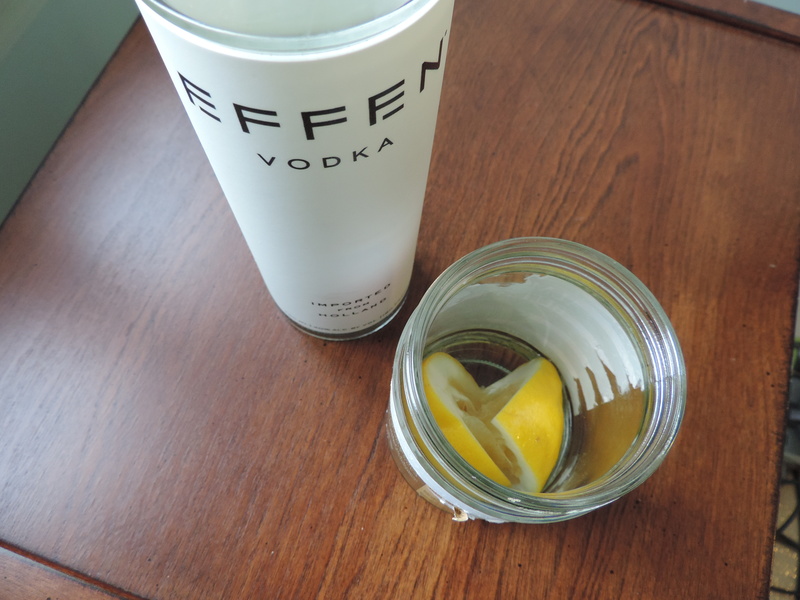 Just throw lemon peels into a mason jar (or other lidded jar), add vodka — as much as you’d like, cover and let sit a few days. Let me tell you, that was the most refreshing and tasty vodka soda I’ve ever had. 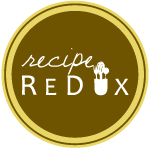 This “feta” is perfect for tossing into a Greek salad, crumbling onto a sandwich, or eating straight. Even better is that it contains no cholesterol and is high in fiber and protein, so you can eat it on everything and feel good about it. You can find white miso paste at Whole Foods or Asian markets. 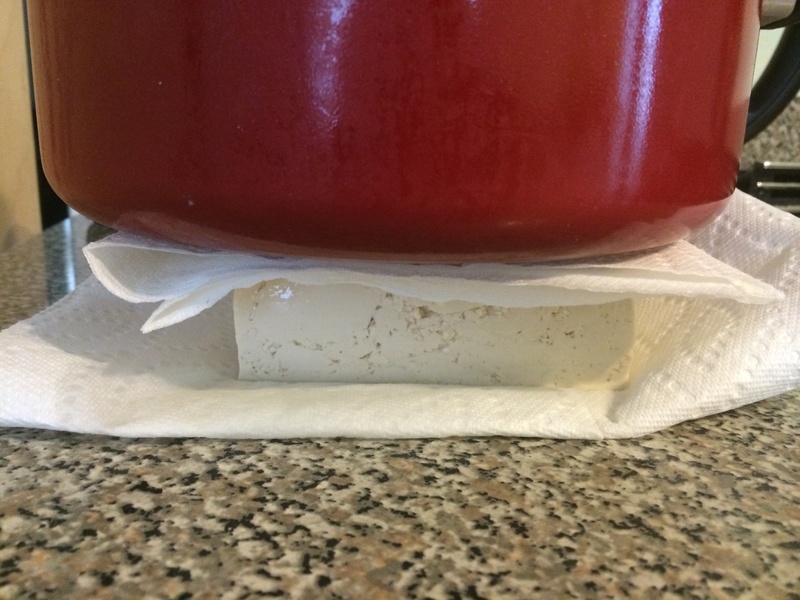 Drain water out of tofu by sandwiching block of tofu between paper towels and placing a pot or heavy object on top (see above). *Be very careful when setting up the pot on top of the tofu. I apparently didn’t balance mine very well and the pot came crashing down — very scary. Cut tofu into sticks (pictured) or cubes. Add to a large zip-top bag. Squeeze lemons into bag and add remaining ingredients. Zip up the top of the bag and mix everything around, being sure to “mash up” the miso paste so that it is evenly distributed throughout the marinade. Refrigerate and let marinate for at least one day, and up to four days. 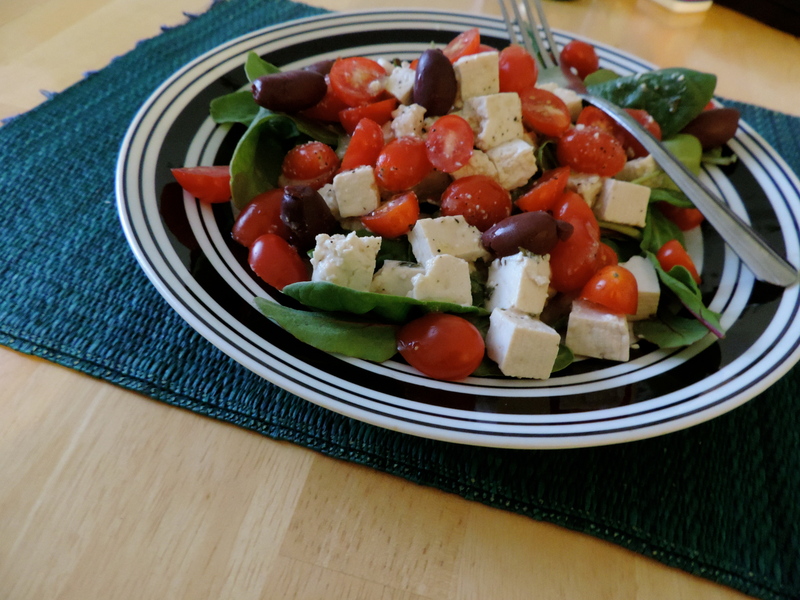 When you’re ready to eat, simply remove desired about of tofu “feta” from bag and crumble over your dish. 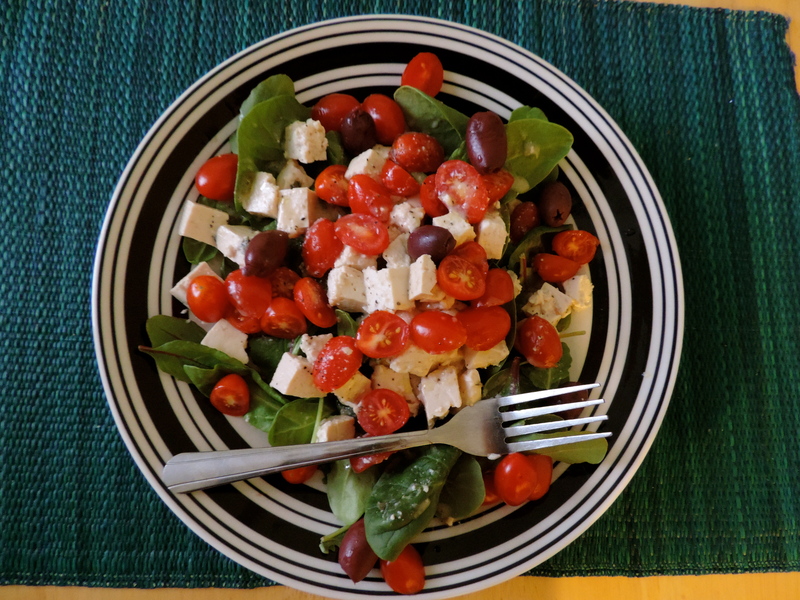 The feta is delicious over a Greek salad, or skewer it with tomatoes, basil and olives for a tasty and protein-packed Mediterranean treat!